For teens who struggle with their weight, it can be easy for them — and their parents — to fret about the number they see on the bathroom scale. But a new set of guidelines says parents can help their teens by taking the focus off what they weigh and instead encouraging good eating habits. The American Academy of Pediatrics (AAP) has issued new evidence-based guidance for parents and doctors on how to help teenagers avoid obesity and eating disorders. The recommendations emphasize that parents need to play a role in promoting healthy eating habits and exercise for their teens, rather than focusing on how much their youngsters weigh. While the AAP previously has issued guidelines on childhood obesity and eating disorders, the new report is the first time the organization has made a connection between the two. The recommendations appear online in the journal Pediatrics. When it comes to kids, it’s best for parents to avoid talking about weight and instead focus on setting a good example through healthy eating and exercise, says pediatrician Vaishali Flask, MD. It’s also not a good idea for parents to take up fad diets and then talk about them in the presence of their kids, Dr. Flask says. Often, youngsters will pick up the things their parents are doing and try it themselves. Real danger exists when teens try weight-loss tactics like fasting, using diet pills or laxatives or performing excessive exercise, the AAP says. Studies have shown that teens who diet actually are more likely than their peers to become overweight and develop eating disorders. Also, eating disorders can be overlooked or hidden because of the misconception that only extremely thin people have them. 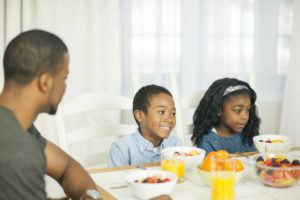 Family meals — Family meals provide an opportunity for parents to demonstrate healthy eating behavior and improve their children’s quality of diet. Focus on healthy eating — Don’t focus on how much your child weighs. Foster a healthy body image — A positive body image has been linked to fewer negative weight control behaviors. The best thing for teens and adults to do if they are concerned about their weight is to talk to their doctor about it, instead of trying measures on their own first, Dr. Flask says.